You all know that I never pass up a cupcake deal. I am constantly looking for the next best cupcake. I have to admit, I found one that I love but seeing another deal on cupcakes is almost a challenge for me! Juice in the City has a great deal on cupcakes. 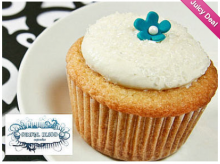 You can get $10 for $20 worth of gourmet cupcakes at Sinful Bliss Cupcakes in Pleasant Hill. Have you been? I haven’t but plan to go very very soon! Head over to Juice in the City and select your location. It’s free and easy to sign up!